Notwithstanding the ugly GDP growth headline number, there are couple of ominous storm clouds forming on the market's horizon. Here are some possible catalysts that could create some volatility for equities in the days to come. Americans are most likely to say the price of energy, the price of food, taxes, and healthcare costs are hurting their family's finances a lot or a little, out of a list of nine economic issues. Americans appear relatively unaffected by the availability of credit or immigration policies. I am watching closely the rally in commodity prices. Should food and energy prices continue to rise and the payroll tax increase starts to really squeeze the American family's pocketbook, we could be in for a nasty surprise in consumer spending. 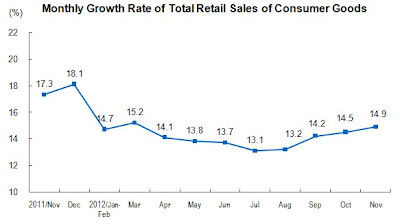 If the American consumer were to falter, then what happens to the economy? An array of proposals are in the works to delay or replace the cuts. But party leaders say they see no clear path to compromise, particularly given a growing sentiment among Republicans to pocket the cuts and move on to larger battles over health and retirement spending. Adding to the sense of inevitability is the belief that the cuts, known as the sequester, would improve the government’s bottom line without devastating the broader economy. Though the cuts would hamper economic growth, especially in the Washington region, the forecast is far less dire than with other recent fiscal deadlines, and financial markets are not pressing Washington to act. Cuts to the military and the defense industry remain politically problematic. But Tuesday, even some of the Pentagon’s most fervent champions seemed resigned to the likelihood that the cuts would be permitted to kick in, at least temporarily. A few months ago, the markets were highly anxious over the prospect of the sequester, which would make deep cuts to government budgets that were abhorrent to both sides. Now, Mr. Market seems to be relatively complacent about the prospect of impending government cutbacks, which would be highly contractionary. Put it another way: the sequester is just another form of forced austerity - and we know how well that worked out for Spain, don't we? The stock market is highly complacent right now and doesn't seem to be bothered by the prospect of going over a fiscal cliff, but when will the anxiety that was evident in Q4 2012 reappear? 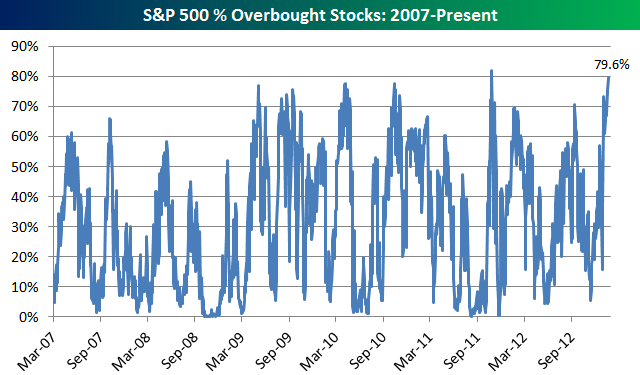 With the markets overbought and sentiment at a crowded long reading (see my previous posts Is the whole world bullish? and More overbought warnings from BoAML), these concerns that I raised makes me think that the stock market is cruisin' for a bruisin'. "Bottom line," Cochinos writes, "Several indicators are calling for a risk correction. USD selling has reached previous reversion levels and greater buy-backs are to come." Cochinos first points to U.S. dollar selling by "real money" investors (i.e., pension funds, mutual funds, insurance companies, et al. ), which has reached extreme levels recently – 1.8 standard deviations from the mean, to be exact. Cochinos believes that the US Dollar is highly oversold and due for a reversal - and a USD rally would typically coincide with a risk-off environment. Some of the analysis of Chief US technical analyst Mary Ann Bartels is also showing highly overbought conditions as well. The latest readings of her industry level overbought/oversold model is showing 16 overbought and 3 oversold industries for a ratio of over 5 to 1 - a highly extended condition [annotations in red are mine]. I don't want to put word in Mary Ann's mouth as she remains bullish and the title of her latest weekly commentary reads "Good earnings and liquidity power the markets higher". 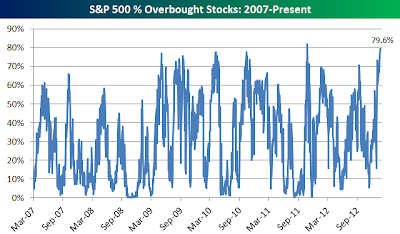 However, the industry level overbought/oversold model is one that I am very familiar with as I was once personally involved in producing that report on a weekly basis. My own interpretation is that, despite the powerful positive momentum exhibited by stocks, these are conditions that usually precede corrections. Is the whole world bullish? Maybe I am over thinking this: The sentiment picture seems just a little too neatly packaged to me and it would be just a little too easy to be overly bearish here. 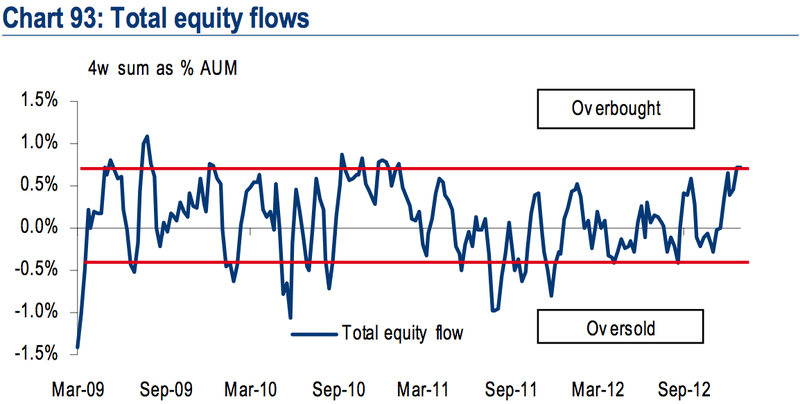 Positive flows into equity funds after a long winter of negative flows could be interpreted as positively as the return of bullish momentum. Indeed, Schaeffer's Research reported enormous buying of VIX calls last week as a bet on rising volatility (and falling markets), which is contrarian bullish. I heard several talking heads on CNBC late last week cited the same kinds of reasons to be bearish from a sentiment viewpoint. While I understand that sentiment models, on an intermediate to longer term time horizon, can give a bearish picture, but is too much trader bearishness supportive of the markets here? The financial crisis is over! The hive mind of Davos has concluded that the financial crisis is done, finished. The new worry: a bubble in the credit markets. There is no official declaration, or even a formal survey. But the chatter at the World Economic Forum in Davos, Switzerland, is about the end of the financial crisis that began in 2008 and dragged on through last summer’s spike in Spanish and Italian government bond yields. “There’s a crystallization of thought that the financial crisis is over,” says Scott Minerd, managing partner and chief investment officer of Guggenheim Partners, a Santa Monica (Calif.) firm with about $160 billion under management. The beginning stages of a great rotation in the markets create opportunities for cyclical and undervalued asset classes poised for recovery. Germany will always do “the minimum” to preserve the currency, Soros said yesterday at the World Economic Forum in Davos, Switzerland. He forecast a “tense” two years for the euro region. Dalio says 2013 is likely to be a transition year, where large amounts of cash will move to stock and all sorts of stuff – goods, services, and financial assets. People will spend more with the cash, they will invest in equities and gold – the cash will move. As much as I would have great respect for investors like Soros and Dalio (and would loathe to be on the other side of a Soros or Dalio trade), the sudden outpouring of bullishness (or in Soros' case, an easing of bearishness) is a short-term red flag for traders. I wrote about my nervousness last week (see Too far, too fast) and I reiterate my concerns about the outbreak of excessive bullishness. Barry Ritholz also pointed out that a New York Times front page article entitled As Worries Ebb, Small Investors Propel Markets is a contrarian Front Page Cover sell-signal. 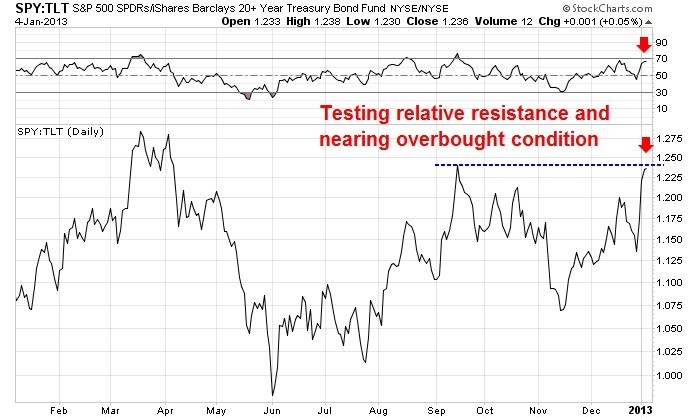 Speaking technically, the relative performance chart of SPY (stocks) vs. TLT (US long Treasury bonds) below as a measure of the risk-on/risk-off trade shows the SPY/TLT ratio in a strong rally and approaching an important relative resistance level. The relative resistance level consists of both the previous highs seen in March/April 2012 and a Fibonacci retracement level, which suggests that the risk-on trade has a high probability of stalling soon. At this point, my base case calls for stocks to correct 5-10%, at which the uptrend continues. However, that scenario is subject to change as circumstances change. We may be nearing an inflection point and will have to take this one day at a time. With the whiff of global economic recovery in the air as major central banks floor cash rates, buy bonds and neutralize systemic stability fears, mutual fund and retail investment flows are already on the move in 2013. 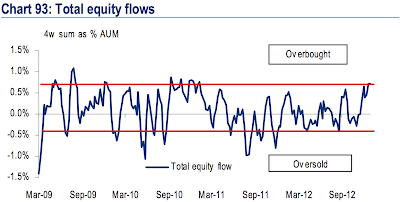 According to Lipper, net flows to U.S.-based equity funds in the first two weeks of 2013 was, at $11.3 billion, the biggest fortnightly inflow since April 2000. Including exchange traded equity funds (ETFs), the number tops $18 billion - well over twice the flow to equivalent bond funds. What's more, fund-tracker EPFR said some $7 billion of inflows to emerging market equities alone in the first week of the year were the biggest on record and these have outstripped demand for emerging bond funds five weeks running. Investors’ appetite for risk in their portfolios is now at its highest in nine years, while an increasing number judge equities as undervalued – particularly in Europe. Moreover, investors have reduced cash holdings to 3.8 percent from 4.2 percent in December. 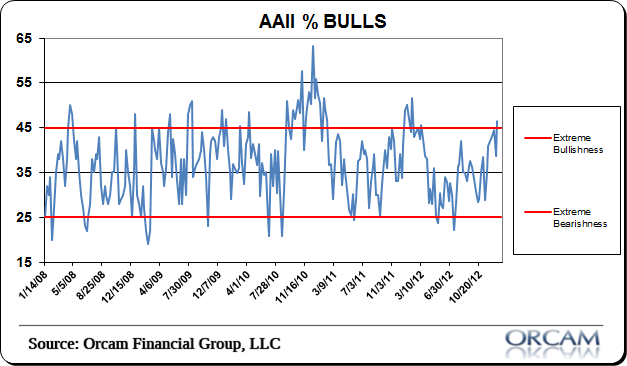 This marks the most positive reading of this measure of willingness to hold riskier investment assets since April 2011, though it has not reached levels that would represent a contrarian sell signal. 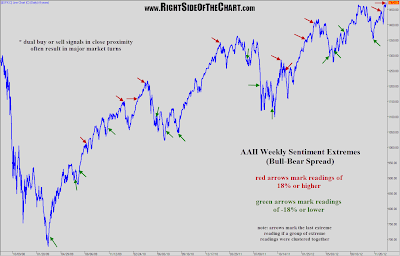 A powerful rally in which virtually all fears have been bypassed has pushed stock marketdetractors to the brink, ready to wave the proverbial white flag as the only direction for the market seems to be up, up, up. "They're almost ready to throw in the towel," Scott Bauer, of Trading Advantage, told CNBC. "I don't want to say 'capitulation,' (but) guys down here really are saying, 'All right, I can't fight it anymore, let's go.'" ...though the longer term uptrend remained intact. I appreciate that there is powerful positive momentum underlying this rally and many of the macro headwinds have turned into tailwinds (i.e., Chinese hard landing becoming a soft landing; the ECB taking tail risk off the table; US fiscal cliff confrontation averted). However, with the bears throwing in the towel, I am inclined to take some profits and take some chips off the table in the short term. We've come too far too fast. With bullish sentiment at such extremes, a corrective pullback is highly probable in the short term. 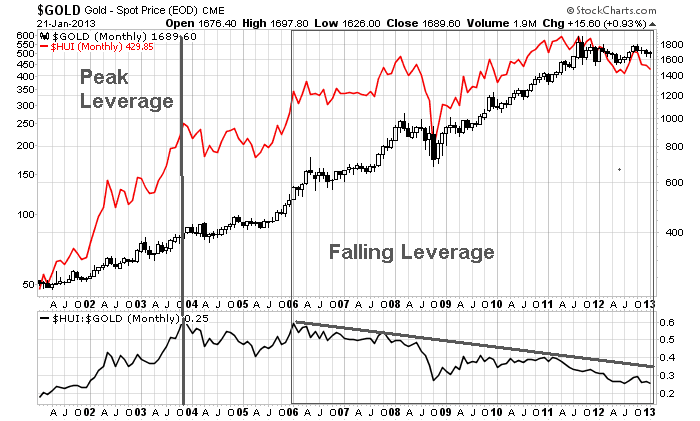 Where is the leverage to gold? Over at Zero Hedge there is a rant about how gold and gold stocks are better investments than the stock market and how there is a Wall Street conspiracy to suppress the gold price and keep the "dumb" investors in stocks. With the Bank of Japan's latest move to fight deflation and seemingly to start another round of global competitive currency devaluation, it does certainly make some sense to hold some gold in a portfolio. However, I remain of the opinion that it makes no sense for gold bulls to hold gold stocks over bullion. Consider this chart below of the price of gold compared to the Amex Gold Bugs Index (HUI). The top panel shows the price of gold in black and HUI in red. The bottom panel shows the HUI/gold ratio. 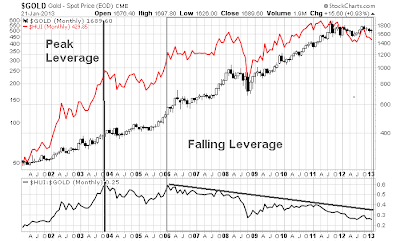 A rising ratio indicates positive leverage to gold and a falling ratio shows falling leverage. The HUI/gold ratio rose and peaked out in late 2003. It then flattened out and started to decline in 2005 and continues to fall today. 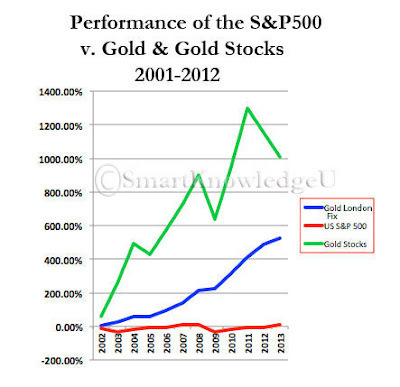 I wrote about this topic in 2011 and 2009 and it continues to be true: Gold bulls shouldn't buy gold stocks! The reason why gold stocks have failed to keep pace with the price of bullion is gold mining companies can't replace lost production at the same cost as the older cheaper ore bodies get mined out. They are mining lower and lower grade ore and therefore their profits and cash flows are lower because of higher production costs (see my analysis Valuing gold stocks on cash flow, not assets). Bottom line: If you are a gold bull, buy physical gold, GLD, CEF, or any other vehicle directly related to the price of gold. Just avoid gold stocks. I suppose that I should be happy and bullish. US equities staged a significant upside breakout last week, indicating positive price momentum. Mid and small cap stocks have staged upside breakouts some time ago to all-time highs, which is a bullish confirmation of the trend. As for the current Earnings Season, Bespoke reports that preliminary indications show that the beat rate is consistent with the historical average. My inner trader has turned more bullish given these developments, but my inner investor continues to be a cautious and worried bull for two reasons: Sentiment and the deterioration in consumer sentiment. 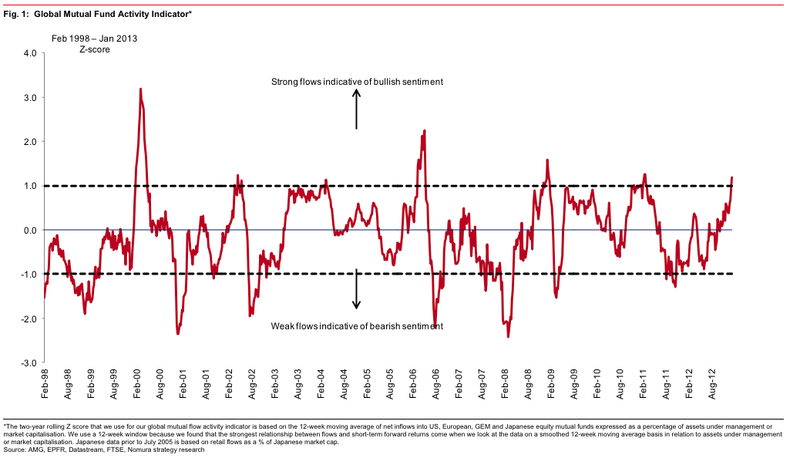 First of all, equity markets are overbought and sentiment measures are overly bullish, which is contrarian bearish (see my comment last week Big test for stocks). 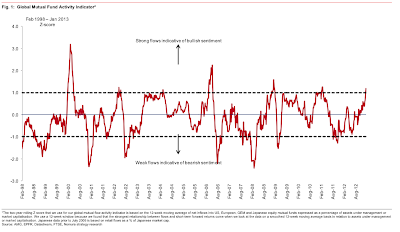 Measure of investor sentiment were in the crowded long zone last week and preliminary indications show that they got even more bullish, which is a warning sign that we could be due for a short-term pullback at the very least. Average U.S. household has about $20 less to spend each week.. When will stocks hit these potholes? My inner trader tells me that these sorts of things don't seem to matter to the market until the market starts to pay attention, so I should relax and enjoy the bullish party. My inner investor is watching very closely for signs of weakness, particularly from the US consumer which could derail this rally. With China's Q4 GDP up 7.9%, which was ahead of consensus expectations of 7.8%, I thought it would be a good time to look at China's likely growth path yet one more time. The Bonddad Blog had an excellent post entitled "Will China Save Us -- Again?" The blog post reviews the (pre-Q4 GDP) data showing a rebound in the growth of China's economy and closes with an indication that growth is re-balancing toward the consumer. Now close to 50 percent of GDP, this paper assesses the appropriateness of China’s current investment levels. It finds that China’s capital-to-output ratio is within the range of other emerging markets, but its economic growth rates stand out, partly due to a surge in investment over the last decade. Moreover, its investment is significantly higher than suggested by cross-country panel estimation. This deviation has been accumulating over the last decade, and at nearly 10 percent of GDP is now larger and more persistent than experienced by other Asian economies leading up to the Asian crisis. However, because its investment is predominantly financed by domestic savings, a crisis appears unlikely when assessed against dependency on external funding. But this does not mean that the cost is absent. Rather, it is distributed to other sectors of the economy through a hidden transfer of resources, estimated at an average of 4 percent of GDP per year. One of the implications of the study is that households and SMEs have been forced to subsidize growth at a cost to them of well over 4% of GDP annually. My own back-of-the-envelope calculations suggest that the cost to households is actually 5-8% of GDP – perhaps because I also include the implicit subsidy to recapitalize the banks in the form of the excess spread between the lending and deposit rates – but certainly I agree with the IMF study that this has been a massive transfer to subsidize growth. But let us...give China five years to bring investment down to 40% of GDP from its current level of 50%. Chinese investment must grow at a much lower rate than GDP for this to happen. How much lower? The arithmetic is simple. It depends on what we assume GDP growth will be over the next five years, but investment has to grow by roughly 4.5 percentage points or more below the GDP growth rate for this condition to be met. If Chinese GDP grows at 7%, in other words, Chinese investment must grow at 2.3%. If China grows at 5%, investment must grow at 0.4%. And if China grows at 3%, which is much closer to my ten-year view, investment growth must actually contract by 1.5%. Only in this way will investment drop by ten percentage points as a share of GDP in the next five years. China is an accident waiting to happen. The only level of uncertainty is the timing. That's why I am watching the canaries in the Chinese coalmine. Notwithstanding the sentiment model readings, here are the key tests that I am watching for the stock market. First, how stocks react to news is always an important indication of market direction. How will the market react to the news that the White House has ruled out the trillion dollar coin as a solution to the debt ceiling impasse? As I write these words, overnight ES futures are slightly positive indicating a lack of anxiety over the elimination of one solution to the debt ceiling debate. The Treasury is expected to run out of money somewhere between February 15 and March 1. 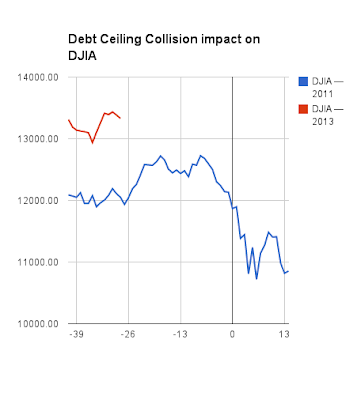 Here is a chart from January 10 (via Business Insider) of how the Dow reacted the last time we had a debt ceiling debate. Complacency reigned, until about a week before the impasse. At that point, the market began to crater. The reaction this week to the end of the trillion dollar coin option will be an important indication of market psychology. 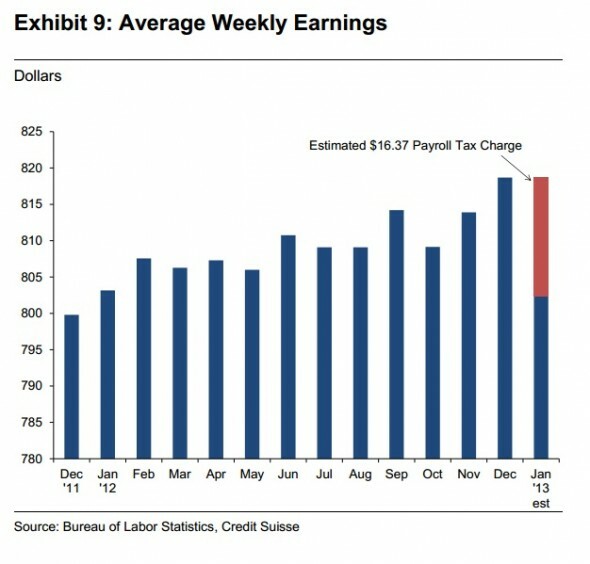 And let's not forget the earnings landscape. So far, we have had 26 S+P 500 companies report and they seem to be meeting their beaten-down targets (indeed, 17 have surpassed their estimates, only six have missed). But of the 11 that have provided guidance, nine have have taken it down and just two have taken it up, for a ratio (albeit on a limited sample size) of 4.5x versus a historical average of 2.0. 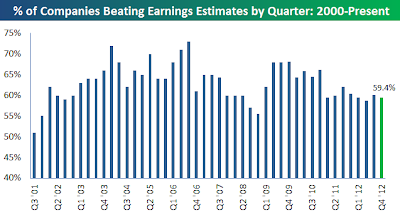 While it's still early, an earnings beat rate of 65% (17 of 26) is only slightly ahead of the historical average. On the other hand, the high level of negative guidance is something to be concerned about. This paper presents new survey evidence on workers’ response to the 2011 payroll tax cuts. While workers intended to spend 10 to 18 percent of their tax-cut income, they reported actually spending 28 to 43 percent of the funds. This is higher than estimates from studies of recent tax cuts, and arguably a consequence of the design of the 2011 tax cuts. The shift to greater consumption than intended is largely unexplained by present-bias or unanticipated shocks, and is likely a consequence of mental accounting. That's why it will be critical to watch the body language from forward guidance, especially from companies that are sensitive to consumer spending. Right now, we are seeing leadership from small and mid-caps in the US, which technicians have pointed to as a sign for being bullish. However, if the American consumer were to falter, then this leadership will start to fading like the morning mist. My inner investor is very nervous about this stock market. My inner trader is a little bit more sanguine and believes that there could be a bit more upside that he may be able to catch. However, he is tightening up his stops to limit his losses and keeping an eye on the exit. The analysis postulated a 50% drop in base metals, Brent crude to bottom at about $75 and an abrupt drop for gold but a recovery thereafter. China’s shadow finance sector is big — UBS estimated last year it is equivalent to at least a quarter of the country’s annual GDP, and maybe as much as half. And it is growing fast; in the second half of 2012 it reached half of ‘total social financing’, the country’s measure of total credit. With slow loan growth in the formal banking system and tightening controls in the shadow banking system, where is credit growth going to come from? 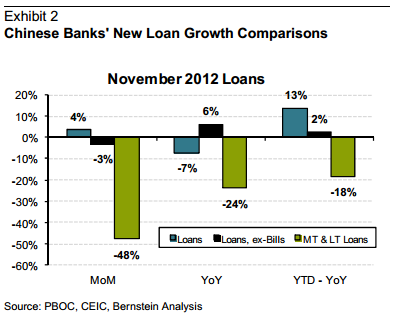 What will happen to the Chinese economy when credit dries up? Whatever the catalyst, the excess capacity in the manufacturing sector – estimated at 40% in 2011 by the IMF – would be exacerbated by a sharp growth slowdown. This would cut corporate margins sharply, making profits plunge, and triggering a downward spiral in domestic demand. Bankruptcies and unemployment would occur on a large scale, endangering financial and social stability. One factor that could accelerate the downward spiral is the high leverage of China’s corporate sector, which exceeded 120% of GDP at end-2011 and has kept rising throughout 2012. As the crisis progressed, non-performing loans would undoubtedly rise beyond the capacity of local governments to contain them, as their fiscal resources dwindled. Even in China’s (semi-) controlled system, banks could choose to freeze lending as a knee-jerk reaction, while the authorities rushed to draft a decisive response. The rapid development of the non-bank credit market in the last few years, especially shadow banking activities, has created a new vector through which a systemic liquidity crunch could take place. Capital outflow would likely ensue, stretching domestic liquidity conditions further. Should restrictions in the shadow banking system cause a credit crunch and collapse in the financial system in China, then we should see a corresponding response in the prices of these banks. Currently, the shares of these four canaries are near or at 52-week highs, indicating little signs of stress in the banking system. Traders should therefore relax but be vigilant. I have always been of the view that the world will see a cyclical downturn one day. The timing of that downturn is uncertain. I have no idea of whether it will happen this year, next year or in the next 5 years. When that cyclical downturn is upon us, however, China's export sensitive economy may not be resilient enough to withstand the slowdown. The result will not be just a hard landing (subpar growth of less than 6%), but possible a crash landing (negative GDP growth) that is not in anybody's spreadsheet. 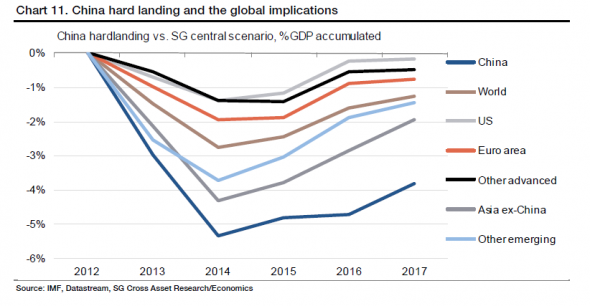 That crash landing scenario would be disastrous for the economies of China's major trade partners and commodity prices and the ensuing tail risk will be in the same order of magnitude as the Lehman or Russia Crisis. That's why it pays to watch the four Chinese canaries in the coalmine. I got a fair amount of feedback from my post From anti-inflation to pro-inflation, where I described the journey that central bankers have taken from 1980 and the height of the Paul Volcker's tight monetary policy era. In the post-Lehman Crisis period, central bankers have changed their focus from fighting inflation to encouraging a little inflation, from monitoring money growth to loose monetary policy, quantitative easing, nominal GDP targeting and, finally, the loss of central bank independence coordination of monetary policy with fiscal authorities. With the news that the new government is about to launch 12T Yen (USD 136 billion) fiscal stimulus program and the BoJ appearing to acquieces and support the stimulus with more bond buying, Japan is the country that has gone furthest down this road. I want to address in this post the likely effects of this shift in central bank thinking on market prices. In the wake of the near-death experience of the Lehman Crisis of 2008, central bankers have taken steps to put a floor on the price of financial assets. Market analysts have called this the Bernanke Put, as applied to the Federal Reserve, and the Draghi Put, as applied to the European Central Bank. These central bank Puts function like an insurance policy with a deductible. 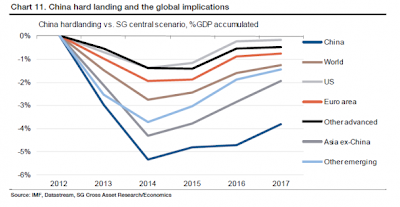 Investors assume some degree of risk, the deductible, but if the macro-economic situation deteriorates to the extent that a market crash is likely, major global central banks have they will step in to rescue the markets. These insurance policies come with costs. 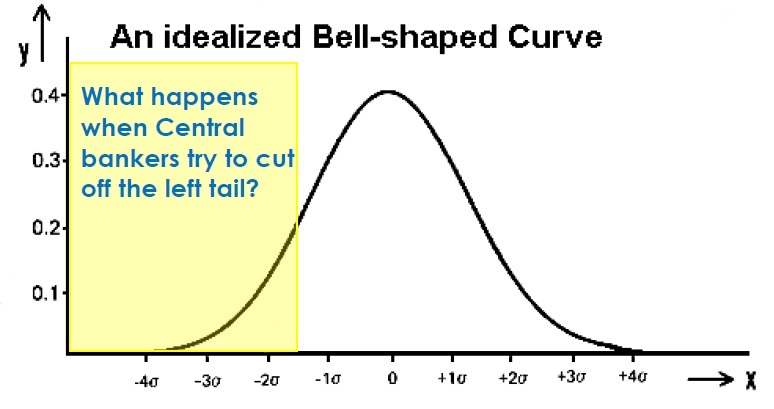 To explain, standard financial theory posits that asset returns follow a bell-shaped distribution. 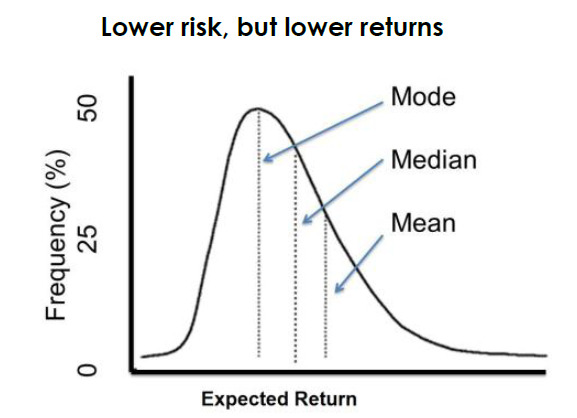 The graph below shows an idealized Gaussian distribution with the returns plotted on the x-axis and frequency, or probability, of those returns on the y-axis. 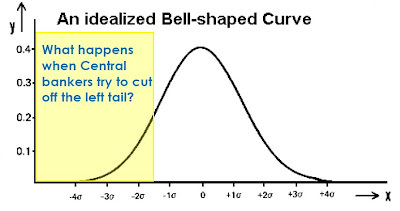 (Yes I know it's not normally distributed but has fatter tails, but it is still a bell-shaped curve.) But what happens to the return distribution when central bankers try to eliminate or reduce the left tail of the return distribution? In Europe, where the ECB’s actions have been combined with a fiscal policy of “all austerity, all the time” and a social consensus that is tilted towards a relatively robust safety net, the ECB has traded off the certainty of a no Eurogeddon scenario against lower growth, as depicted by the idealized graph on the below. Note how the expected return distribution is no longer symmetrical as the left tail has been cut off. The “mode”, or the value that is likely to appear the most, is also skewed to the left. The risk of a eurozone sovereign or banking crisis is off the table, but Europe is in recession. While the actions of the ECB has bought time for EU member states to move toward structural reform, the price paid is lower growth in the short-term. In addition, I believe that the actions of global central bankers have made the markets more volatile in the short-term. 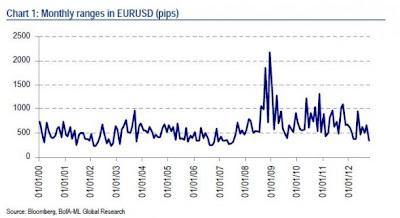 The FX team at Bank of America/Merrill Lynch (BoAML) (via FT Alphaville) observed that volatility in the euro-US Dollar exchange rate has risen dramatically in the past few years, as shown by the graph below. It is perhaps somewhat counter-intuitive, as low volatility has traditionally been associated with low uncertainty, but we are still seeing high levels of uncertainty in FX. This is understandable given the large number of risks across multiple regions (for example, Eurozone financial crisis, weak US growth, US fiscal cliff and China slowdown). Further, these types of risks leave investors tracking policy makers and trading news headlines for policy trajectory information. This is resulting in sudden and rapid moves in FX followed by periods of range-trading. By eliminating tail risk and raising certainty, central bankers have ironically raised short-term volatility instead. In conclusion, central bankers can't completely eliminate volatility and their policies come with costs. In the case of Europe, the ECB has traded Eurogeddon for a recession. In general, market volatility has risen and become far more sensitive to headline news. It just goes to show that there is no free lunch in central banking. I called for a Santa Claus rally in late November (see Waiting for a Santa Claus rally) and equity markets cooperated and prices have moved up strongly since then. Now that Santa Claus has come and gone and we have seen the "fiscal cliff" relief rally, what's next? Technically, there are a lot of reasons for stocks to at least pause at these levels. The SPX is now testing an important resistance level. More comforting for the bulls is the broader NYSE Composite has managed to stage an upside breakout through resistance, indicating that the underlying strength is broad and deep. However, I don't expect that the SPX will break through to new highs in the short run for several reasons. Simply put, this bull is getting tired and this latest up move is facing too many headwinds. 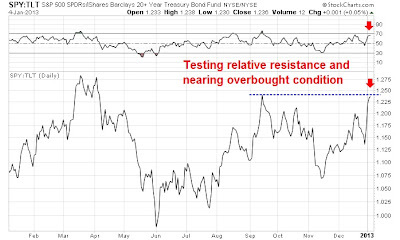 First of all, the SPY to TLT ratio as a measure of the risk-on/risk-off trade is also testing a relative resistance level and showing a near overbought reading where stocks have retreated in the past. In addition, the VIX Index has retreated to a major support zone where it has bounced off in the past. The CBOE noted that the VIX saw its largest percentage move since inception (h/t Global Macro Monitor), which is another sign of an oversold condition for the VIX and overbought condition for equities. In order for the stock market to advance, volatility would have to fall through a major support level. 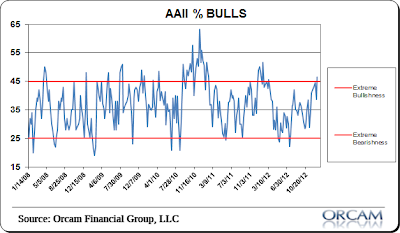 Last but not least, the bulls have to contend with the seasonal patterns seen in past Presidential cycles. As the chart below from the Chart of the Day shows, the opening week of the first year of a presidential term starts with a rally, which we have seen right on schedule, and the market starts a broad decline into February. So far, the stock market's behavior in 2013 is consistent with this historical pattern. In addition, Earnings Season will be a source of volatility for stocks. Barry Ritholz warned about an "earnings cliff" and Q4 earnings will be an important test of his thesis. I explained before (see What happens after the Santa Claus rally?) that the "earnings cliff" is the result of a deteriorating profit outlook by large cap multi-national companies. In that context, the outperformance of the NYSE Composite, which is more reflective of small and mid cap stocks, is consistent with that thesis. For the upcoming earnings season I remain open-minded and I will be very attentive. Last quarter was a minefield for corporations. If the complete story -- earnings, revenue, outlook -- was not perfect, the stock price moved lower. I avoided earnings dates in our most aggressive trading programs, and I was nearly always right. I have more respect for the analyst updates than I do for the pontificating pundits with opinions but absolutely no record. I understand that analysts are too bullish in their multi-year forecasts -- basically following trends with no allowance for bad news. I also understand that by the time earnings are actually reported, the bar has been lowered so that more than 60% of companies beat expectations. If estimates are too bullish in the long run and too bearish at the time of the report, there must have been a "crossover date" when the forecasts were pretty good. My research shows that this occurs at about one year in advance. To summarize: This earnings season will be important for estimate revisions as well as the current "beat rate." In short, the bull case is facing too many technical and fundamental headwinds to see the market advance too much further in the short-term. I believe that we are likely to see a pullback at these levels. The bulls will have to watch how the market behaves in response to news, such as the upcoming Earnings Season and the political posturing that is likely to occur over the Debt Ceiling, in order to discern the likely direction of the next major move. Regular readers know that I have stood against the idea of a gold standard (see my previous posts in 2008, 2010 and 2011). I have always regarded the hard money crowd as longing for a mythical time and place that never quite existed. The full economic impact of [the dragon] Smaug [with his gold treasure hoard] can only be understood by recognizing that the dragon's arrival resulted in a severe monetary shock. On the left is shown Smaug's hoard. On the right, for purposes of comparison, are the gold reserves of the Bank of England. It is clear from a simple inspection of these two figures that the amount of gold coinage Smaug withdrew from circulation represents a significant volume of currency. This would, inevitably, lead to deflation and depressed economic activity. Bottom line: I am against the adoption of a gold standard because such a regime creates inflexibility that creates unnecessary volatility for an economic system, regardless of whether the system is real or mythical. To put it differently: the Fed thinks the economy isn’t that great and there’s very little inflation to worry about, but its primary program to improve the economy doesn’t do very much. It’s a clear admission the Fed is running out of gun powder. And that’s quite a shot it has fired to the markets. You may have noted that I did not include money growth in this list of inflation determinants. Ultimately, inflation is a monetary phenomenon, as suggested by Milton Friedman's famous dictum. However, no contradiction exists, as the expectational Phillips curve is fully consistent with inflation's being determined by monetary forces in the long run. This point, originally made by Friedman himself, has been demonstrated in many textbooks and so I will not discuss it further here. I only note that, as an empirical matter, instabilities in money demand, financial innovation, and many special factors affecting the monetary aggregates make them relatively poor predictors of inflation at medium-term horizons. For this reason, the role of the money supply remains implicit in this discussion. In other words, PQ = MV doesn't work well in the short term because V, or monetary velocity, is not constant. Discussing the optimal objectives for Japanese monetary policy is all very well, but what of the argument, advanced by some officials, that the Bank of Japan lacks the tools to achieve these objectives? Without denying the many difficulties inherent in making monetary policy in the current environment in Japan, I believe that not all the possible methods for easing monetary policy in Japan have been fully exploited. One possible approach to ending deflation in Japan would be greater cooperation, for a limited time, between the monetary and the fiscal authorities. Specifically, the Bank of Japan should consider increasing still further its purchases of government debt, preferably in explicit conjunction with a program of tax cuts or other fiscal stimulus. Isn't it irresponsible to recommend a tax cut, given the poor state of Japanese public finances? To the contrary, from a fiscal perspective, the policy would almost certainly be stabilizing, in the sense of reducing the debt-to-GDP ratio. The BOJ's purchases would leave the nominal quantity of debt in the hands of the public unchanged, while nominal GDP would rise owing to increased nominal spending. Indeed, nothing would help reduce Japan's fiscal woes more than healthy growth in nominal GDP and hence in tax revenues. Potential roles for monetary-fiscal cooperation are not limited to BOJ support of tax cuts. BOJ purchases of government debt could also support spending programs, to facilitate industrial restructuring, for example. The BOJ's purchases would mitigate the effect of the new spending on the burden of debt and future interest payments perceived by households, which should reduce the offset from decreased consumption. More generally, by replacing interest-bearing debt with money, BOJ purchases of government debt lower current deficits and interest burdens and thus the public's expectations of future tax obligations. Of course, one can never get something for nothing; from a public finance perspective, increased monetization of government debt simply amounts to replacing other forms of taxes with an inflation tax. But, in the context of deflation-ridden Japan, generating a little bit of positive inflation (and the associated increase in nominal spending) would help achieve the goals of promoting economic recovery and putting idle resources back to work, which in turn would boost tax revenue and improve the government's fiscal position. Is the Fed out of bullets? Definitely not. Once you recognize that Bernanke believes that the mission of the Federal Reserve has moved from primarily an anti-inflation mandate to a pro-inflation (anti-deflation) mandate, you understand how far Bernanke is willing to go. As I write these words, most equity markets are melting up between 1% and 2% in Asia and Europe in the wake of the news of a "fiscal cliff" deal in the US Congress. While my Inflation-Deflation Trend Allocation Model remains in at an "inflation" reading indicating a risk-on environment, I am a very nervous bull. Doesn't this deal set the United States up for more political drama at the end of February? Two months isn't a long time, even for a trader. 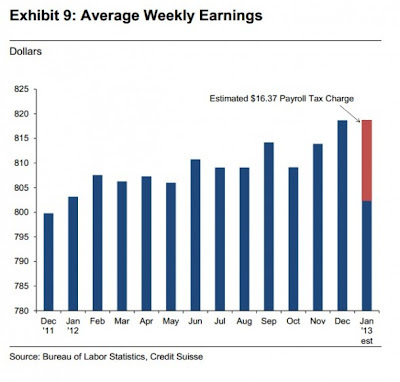 The payroll tax cut didn't get extended, which is an effective tax increase on the middle class. What will happen to consumer spending and consumer confidence? Isn't this contractionary for the economy? If my rough math is right we’re looking at something in the range of $225B in cuts out of a potential $575B. The total drag on the economy (using the CBO’s fiscal multipliers and Goldman Sachs estimates) is ~1.3%. I know that risky assets are rallying in relief because it could have been worse, much worse, but isn't a 1.3% drag on the economy bad? Don't get me wrong, I turned more positive on risky assets in November and have gotten increasingly bullish ever since. I am long and I am enjoying this party. Nevertheless, I am edging closer to the exit and keeping an eye for the cops, who will no doubt raid the joint.